In a large saucepan, bring about 6-8 cups of water to boil (or follow the package directions for cooking the pasta). Add a little salt if you want and add the pasta. Boil the pasta until it's almost cooked; should be soft but still a little chewy. Drain and cool the pasta. Heat oil in a saucepan. Add the cumin seeds and fry for a minute. Add the onions and saute on medium heat for 2 minutes. 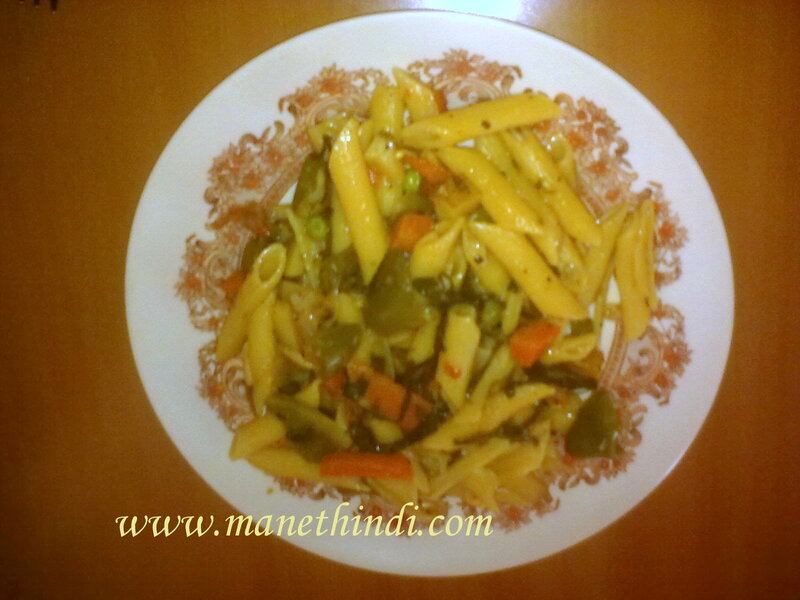 Then add capsicum and carrot with some salt and saute until the vegetables are tender. Add all the spices and fry for 2-3 minutes. Add the drained pasta and mix well and cook for a couple minutes. Add 3-4 tsp tomato sauce. Mix well and enjoy it hot!